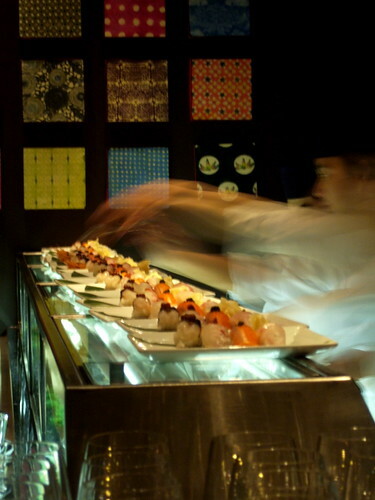 Photo: Sushi chefs preparing plates at Zentan. March 3rd at Zentan restaurant in Washington, D.C., Trevor Corson (a native of the D.C. area and author of The Secret Life of Lobsters and The Story of Sushi) gave the first in a planned series of “sushi concierge” presentations. He hopes to come down to D.C. whenever he can book enough people for his sushi talks. I, of course, was lured out by the promise of sake, hoping to score something new. While I was waiting at the bar for the event to start, I tried some Wakatake junmai daiginjo: sweet, smooth, fruity, but I had a hankering for something a little more fleshy that evening. The Zentan sake list discombobulated me. Several of the sakes are only listed by their English translations rather than their Japanese names. Thus, Ama no To is listed as simply “Heaven’s Door.” The English translations are nice to have, but why no Japanese transliteration? I was completely unmoored by these de-Nipponized sake names with no brewery listings. I’m praying this is not the wave of the future. 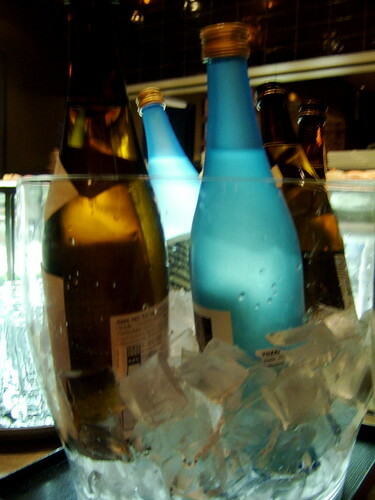 Photo: Three selected sakes of the evening. Corson’s presentation was designed to help one experience throwback sushi, that is, the more classic fish, rather than the common American style of sushi. As he put it, “Hey, I happen to like California rolls, but I think we should search out a fuller experience.” He specifically excluded salmon and bluefin tuna from the evening’s menu because they are not “traditional,” and wanted to focus on white and silvery fish and shellfish. Whether or not we need to buy into the concept of historical sushi fish versus modern fish, he makes a sound plea for diversity in sushi eating. Nothing in his lecture was particularly earthshaking, but his focus on expanding the repertoire of sushi in America is admirable. He’s trying to get Americans to eat less appreciated fish that sushi chefs want to serve in the States but can’t get their customers to order. Thus, he emphasized that one should concentrate on texture from shellfish and the more subtle flavors of certain fish rather the “obvious” fatty and simplistic tuna belly, salmon, and unagi. Bluefin tuna should be off the menu for many obvious environmental reasons, but I like Corson’s manner of selling species diversity as evidence of diner sophistication. Will America buy it? Probably not, but it’s a worthy message. We were served what is apparently the Zentan signature dish, Singapore slaw, which at first has some nice flavors and textures with hazelnuts and fresh radish and crispy rice noodles. Then it gets soggy and makes one think of July 4th party leftovers. The first of three sakes was Ame no To (Heaven’s Door) tokubetsu junmai. This is an old friend of mine from Japan, with that delightful crisp and ricey palate. Good stuff, and not hard to find in the States. In fact, all three sakes of the evening were Vine Connections imports. Corson declined to comment much about the sakes, saying he doesn’t have enough knowledge to do the subject justice. Disappointing, I wonder if he needs a lecture partner? Round one of some well-made nigiri sushi: kanpachi with yuzu garnish, ocean trout with California caviar, madai with umeboshi, sweet shrimp with salmon roe and deep fried shrimp heads (particularly yummy), anago (sea eel) with the standard eel sauce. Corson moved on to some well-known etiquette issues: Americans need to stop insulting sushi chefs by rubbing their wooden chopsticks together before eating (something I’ve always found bizarre). Later in the evening when he stopped by our table, I offered him my theory that some people feel the need to “remove splinters” because they are tightly (and incorrectly) pressing their lips against the chopsticks as they pull them out of their mouths (like a person eating chocolate cake with a fork). He also counseled against pouring copious amounts of soy sauce, making a wasabi slurry, and sloshing away with the fish. As he put it, sushi chefs have told him when they see this they ensure that customer is “off the best fish list for the night.” Again, the choir says, Amen Brother. He made an interesting point about how tightly sushi rice is packed for nigiri in the United States and that one way to get your sushi chef to regard you as good fish—worthy (the secret stash under the counter) is to ask for a looser pack on the rice. In this case, you’d eat the sushi with your fingers, something he encourages. Corson confirmed a suspicion I had that sushi chefs in the States were preparing very sweet sushi rice compared with the sushi rice in Japan (even allowing for Kansai/Kanto variations). He said Japanese sushi chefs learn quickly that sweeter rice sells more sushi because it pleases the “American palate.” There’s mention of the American palate again! Someone please wash out America’s mouth with soap. Sushi round two: sea scallop, horse mackerel with ginger and scallions, flounder with chili daikon, and ye olde bara zushi of mackerel and kelp. 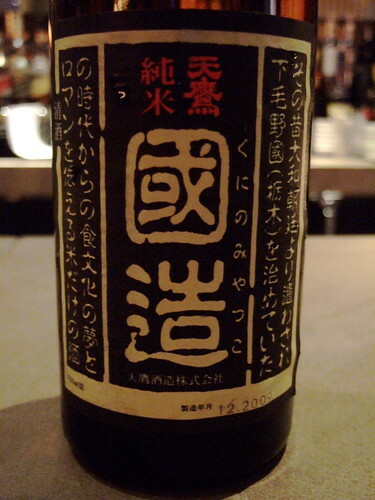 Sake two: Tentaka Kuni (Hawk in the Heavens) junmai. More about that below. Lecture concluded, Corson visited all the tables to answer questions, and miso soup was offered tragically in a lipped bowl with stainless steel spoons. I stared at the bowl on the table and held the spoon above it wondering what was wrong. Then I realized that so much of the enjoyment of miso soup is bringing the bowl up close to the face, appreciating the aromas, and sipping from a warm lacquer (ok faux-lacquer plastic) bowl. With Western-style etiquette plus a wide lip on the bowl keeping it anchored to the table and the feel of the cold, stainless steel soup spoon, the miso soup lost all its allure. I left it. The Tozai ginjo nigori (Voices in the Mist) served with dessert was crisp and not as cloudy as many nigoris. Very nice, and I am hard on nigori sake. Dessert was an enjoyable, modern almond panna cotta with pineapple raspberry ravioli and passionfriut sauce. Photo: Tentaka Kuni (Hawk in the Heavens) junmai. I played nice with our waiter and he brought me a free second glass of the Tentaka Kuni. I may have to revisit this one for the interesting bitter nutty taste with a widely spreading palate. Intriguing. Has some warming potential but was served cold that evening. See Trevor Corson’s Sushi Concierge site for more about these lectures in D.C. and New York. He admits that his standard lecture must be aimed at sushi newbies. A private lecture (you must have at least 6) might be better for people who want to delve deeper. Madam, you ARE a Sei Shonagon!